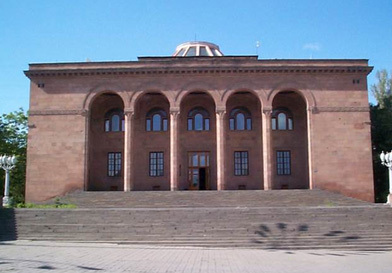 Armenian Academy of Sciences (since 1993 - the National Academy of Sciences of the Republic of Armenia) was founded on 10 November 1943 on the basis of the USSR Academy of Sciences' Armenian Branch, organized in 1935. One of the founders and the first President of NAS RA was Full Member of the USSR and Armenian Academy of Sciences Prof. Hovsep Orbeli. During 1947-1993 the President of NAS RA was Prof. Victor Ambartsumian, Full Member of the USSR and Armenian Academies of Sciences. During 1993-2006 the President of NAS was academician Fadey Sargsian. Since 2006 the President of NAS RA is academician Radik Martirosyan. NAS RA is a highest state scientific self-governing organization which unites NAS Members and scientific staff of affiliated scientific and research institutions. The Academy promotes and carries out fundamental and applied research in different scientific fields, as well as coordinates research carried out throughout Armenia. NAS RA is an official scientific consultant to the highest Governing Bodies of Armenia. NAS RA is mainly financed from the state budget. Additional finances come from different state and private foundations, as well as from direct contracts between the Academy and other organizations in Armenia and abroad. As a state scientific organization NAS RA unifies the scientific and research institutes, subsidiary services and governing body - the Presidium of the Academy includes more than 34 scientific institutions and other organizations. Several Institutes have experimental plants, special design bureaus, botanical gardens, etc. The Presidium of NAS RA also includes Fundamental Scientific Library, Scientific Information Center, International Scientific Educational Center, "Gitutyun" Publishing-House and subsidiary services. Within the Presidium there are 5 scientific Commissions and Councils (Publication's Council, Energetic Problems' Council, Computing Technology Application Commussion, International Scientific Collaboration Council, Expert Commission on protection of Lake Sevan) and Councils on particular scientific area in every Division.